There are 3 items on this page. *note: Selene also informs me that the Croce expedition to the purported Della Porta site is recounted in Vita di Pietro Giannone scritta da lui medesimo, edited by Fausto Nicolini, Naples, Pierro, 1905. —14 prose comedies and 2 dramatic tragedies. Della Porta also started a private museum of natural science, full of specimens collected during his wide-ranging travels in Europe; it was an important innovation and became an imitated prototype. He also claimed to have beaten his younger contemporary, Galileo, to the telescope. (Be that as it may, one thing is certain: Della Porta got into Galileo-type trouble with the watchdogs of the Roman Inquisition* for his "secret academy". The Inquisition closed it down in 1578, and Della Porta's works were banned from publication between 1594-98.) In his spare time (! ), he published De Furtivis Literarum Notis, a work on cryptography, admired even in modern times. God, Set, and Isis (on the left) nursing the infant Horus. Giambattista Della Porta was born in the village of Vico Equense on the Sorrentine peninsula and was well educated at home by his father and private tutors. His father was in the service of Holy Roman Emperor, Charles V. From all accounts, Giambattista was a prodigy; he may have written the first four books of Natural Magic when he was 15 years old. The entire work was virtually a compendium of science since the time of the ancients down through Della Porta's own day; it covered geology, cosmology, plant products, medicines, poisons, distillation, the magnet and its properties, gunpowders, and ciphers. It also covered things such as demonology, astrology, occult philosophy, women's cosmetics, and transmutation of metals, none of which are considered particularly scientific today, but in the late 1500s everything was fair game. (Indeed, a glorious age!) In short, whatever you wanted to know, Della Porta had written about it or was in the process of doing so. It was an immediate best seller and was translated almost immediately from the original Latin into Italian, French and German; an English translation was published in the 1650s. Even in Latin, however, the work was accessible to all European scholars when it was written. Della Porta lived in a strange time—the tail-end of the age of "pre-science". To put things in perspective, young Giambattista's father remembered (!) Leonardo Da Vinci. Della Porta worked a generation before Galileo and Bacon (both inspired by Della Porta's tenacious will to investigate nature), a half century before Kepler and Descartes, and a full century before Newton. It was an age that still clung to the Renaissance vision that one good person with drive, time, and a very large brain could learn everything there was to know. He mixed valid work in optics and botany (two of many examples) with nonsense about fortune-telling and the "philosophers' stone". He also soft-pedaled his brash curiosity when the Inquisition told him to. But even Galileo did that. Della Porta joined the Jesuit order towards the end of his life. That disqualifies him, in the minds on many, as being counted as an early scientific rebel like Galileo. And maybe he wasn't. Maybe he was just a man who wanted to "survey the whole course of nature". That has to count for something. He was interred in the family tomb within the church of San Lorenzo in Naples. update May 2014: Fulvio Salvi of Napoli Underground (NUg — the second link directly above) has suggested an alternative to the traditional view that the site in Naples was Della Porta's academy. Below is my translation of his article that appears on the NUg website. Used here by kind concession. Academy of the Secrets—or “simply” a Garden? About 25 years ago two geologist friends and I were hunting around on the slopes of the street named Due Porte all'Arenella in an attempt to pinpoint the locations of some caverns that historical sources place in that area. I came across a small grotto that at first left me perplexed. There were three spaces connected by tunnels and corridors; on their surfaces you could still see frescoed plaster, reconstructed columns, semi-cylindrical niches and traces of engraved plaques. It had all been altered in some way. You could still make out part of the fresco representing three subjects: a woman seated on a bench holding a child in her lap, and a human figure with a damaged face holding out a tray of offerings to her (photo in the main entry, directly above this one). Very probably the artist had intended to depict in Egyptian fashion the goddess Isis nursing Horus. In the same space (a corridor about ten meters long) on the side walls, the plaster had been frescoed to simulate opus reticulatum [a Roman reticulated pattern of diamond-shaped bricks]; there were also four or five semi-cylindrical niches that were empty but led us to believe that they had once held statuary or similar. At the end of this passageway was a single wooden door that led to the outside. We later discovered that this was the bottom entrance to the grotto. The next chamber (the first room) was jammed with building materials; the walls were covered with panels that hid the surface of the wall in back. In any event, you could see a circular column in the room inscribed with an elongated numeral 8 like a kind of infinity symbol except that it was vertical. A low tunnel led from this room into a second space. The entrance to the tunnel had also been shaped to resemble a large numeral 8. After a couple of meters the tunnel came out in the second room; the walls still had traces of frescoed plaster but the images were so degraded that you couldn't make out what they were meant to be. In this space there were two fake columns (made of brick and plaster); one was circular, the other was square. There was a horizontal niche on one wall that originally must have been sealed by a plaque, traces of which were still visible. The back wall was of brick and irregular-shaped tufa blocks; a series of openings (a door at the bottom and some spaces for oil lamps higher up) gave the impression that it was meant to represent a face or perhaps a skull (photo, above. Courtesy of NUg). This last wall separated this space from a small parking space behind; it was of recent manufacture and belonged to the building on the surface above. Yet another short passage led to a third room almost totally filled with dumped earth, probably hauled in from a well on the surface. There was a hole high up on on the side of the second room that led to a narrow and steep stairway made of brick that, in turn, led to a garden on the surface. It had been from these stairs and then by lowering ourselves from the hole in the wall that we first gained entrance to this underground chamber. Obviously, we were amazed at first glance by all of this. 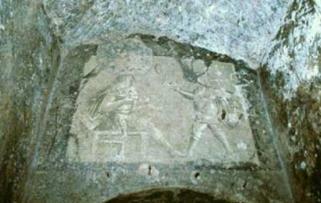 We had explored hundreds of spaces beneath Naples, but this was the first time that we had found something like this! We made sketches and took some photos of the grotto. With these in hand we tried to attract the interest of the Superintendency of Naples, but to no avail. Given the difficult access (we had got in only by lowering ourselves through a hole in the wall) and the fact that this particular space really wasn't part of our original research plans, we put it off for another few years. Another decade passed and I found myself talking with engineer Clemente Esposito (a veteran of Neapolitan speleology) about how the whole thing had sort of gone back into oblivion. Thanks to his insistence and that of my daughter, Selene, I contacted the owner of the property to get permission to enter the premises once again. We reached an agreement. Thus, years later we went back into the grotto, this time by the more comfortable lower entrance. Everything was as it was when we had seen it for the first time. We took more photos and made a video. But the question remained: What could this space have been that no one seemed to know anything about and only old-timers in the area still knew as the teatrino (little theater)? Esposito was of the opinion that the cavern might have been the laboratories of Giambattista Della Porta, a secret place where meetings of his famous Academy of the Secrets were held. 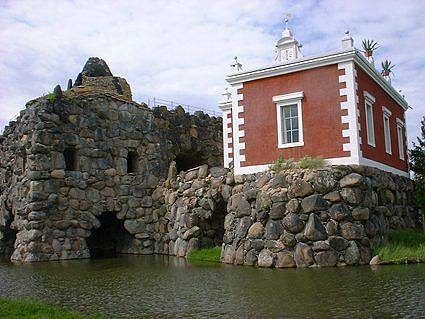 The residential quarters that surrounded the grotto must have been the summer homes of the Della Porta family. But was it really? Or was it rather nothing more than a sophisticated and fascinating garden structure, part of the property of the ancient casale [a large country estate] that we find on the Duke of Noja map, perhaps torn down in order to make room for more modern cement buildings? In the 1700s and 1800s a number of aristocratic villas and royal residences in Naples took up the fashion of building those famous “English landcape gardens” that had so much success elsewhere in Europe. I am thinking, among the many examples, of the Capodimonte Wood with its fake dovecotes near the so-called Grottoes of Maria Cristina di Savoia, and of the fake ruins within the grounds of the Villa Floridiana, or the gardens of the Caserta Palace, or the villa Heigelin (known as the “English villa”), where the gardens, rich with grottoes, ruins and statuary, contained a true Masonic path laden with esoteric symbols. The rest of Italy had its own examples. Among the many, there was the hypogeum [underground chamber] of villa Francescati in Verona, the vaulted entrance of which is so similar to the one at Arenella. Further, there is the curious structure of the Dessau-Wörlitz Gartenreich (Garden Kingdom) in Germany (photo above, right), considered the first English park built in continental Europe in the 1700s. It holds a “stone island” and next to that a reconstruction of William Hamilton's villa at Posillipo in Naples. The stones were meant to simulate the pyrotechnical results of a fanciful eruption of Vesuvius! 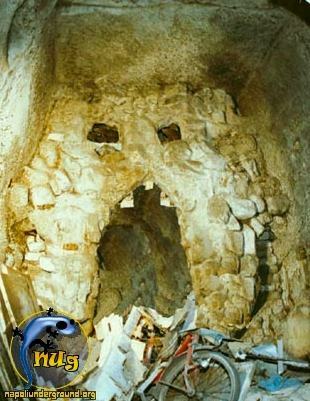 Here, too, there is a vault with wide-open eyes and mouth, similar to the Neapolitan hypogeum... did Naples take the idea from Germany...or perhaps the other way round? It helps to have read parts 1 & 2, above. in the region of Viterbo, north of Rome. GB: "Or maybe a jack-o'-lantern." GB:"Those pumpkins you carve out and put a face on to scare away evil spirits on St. Andrew's day. There's a nice little folk tale I'm working on..."
GDP: "That's very interesting. Look, I'm a little busy here..."
Also, In ancient times, volcanoes were thought to be entrances to the underworld, which may explain the presence in the Dessau-Wörliz park of Mt. Vesuvius (entry#2, above, bottom photo) shaped with the face/skull as the entrance to the volcano and death, yes, but really to eventual rebirth and knowledge. Also, if you wish to expand your search parameters, or as scholars say, "Really go nuts with this, "you may find that Golgotha, the hill upon which Christ was crucified was named Golgotha, meaning "place of the skull." Death and Resurrection. 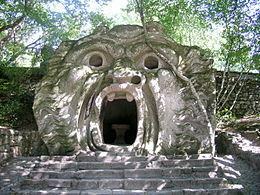 My erudite informant also says she wonders if the face/skull might have something to do with La Bocca della Verità (the Mouth of Truth), a marble image of a man-like face at the church of Santa Maria in Cosmedin in Rome. The sculpture is probably part of a first-century ancient Roman fountain thought to represent the ancient god of the river Tiber. The salient bit of myth here, however, is the legend that says if you tell a lie with your hand in the mouth of the sculpture, it will bite your hand off! 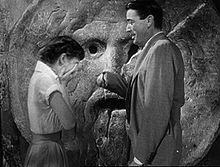 In popular culture, that bit of legend was spread around the world in the 1953 film, Roman Holiday. Gregory Peck puts his hand in the mouth of the stone figure (photo, above, left) and whispers sweet nothings to Audrey Hepburn and... all of a sudden! ... (No, I don't remember, and I wouldn't want to spoil it for you!) Of further popular note, "The Ghost Who Walks"—yes, none other than the comic strip adventure hero, The Phantom, has a really neat house—the Skull Cave! Yes, when Superman (1938) was still sucking mother's milk on Krypton and before Batman and his cave (1939) there was the Phantom (image, right). (He is not the first Masked Avenger. There are precedents such as The Scarlet Pimpernel, Zorro and the Lone Ranger, all of whom wore masks, yes, but the Phantom was the first to sport that skin-tight body suit. I rest my case.) 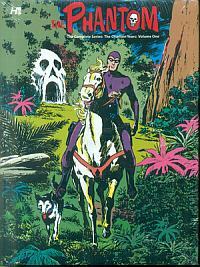 Creator Lee Falk, who started the Phantom series in 1936, died in 1999, so I can't ask him where he got the idea of the Skull Cave. If you know, please tell me, but I don't want to hear that the Phantom lives in a pumpkin. 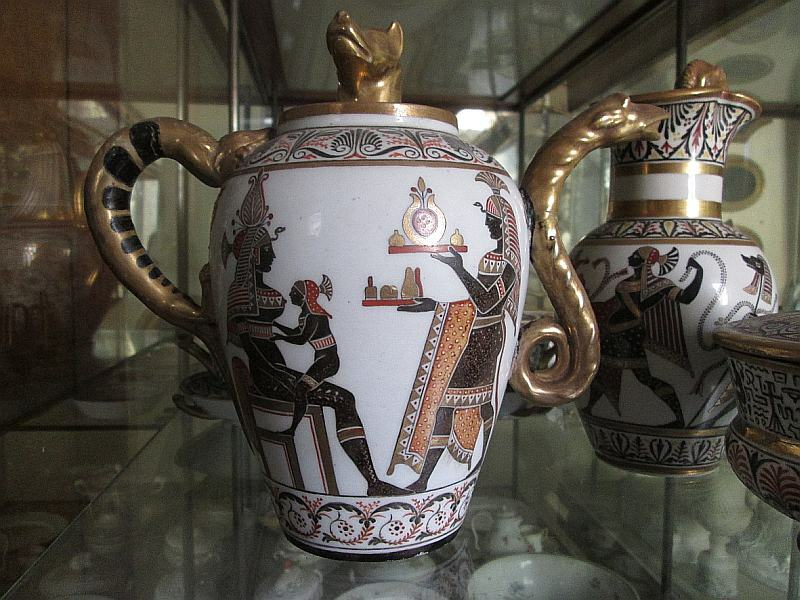 Neapolitan artist Selene Salvi has sent me this photo related to numbers 1 and 2 (above): respectively, Della Porta's use of Egyptian motifs and "Academy of the Secrets — or simply a garden?" A MUCH larger image plus details are here.